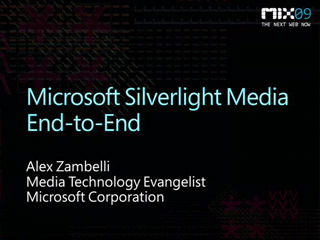 Alex Zambelli is a Media Technology Evangelist in Microsoft’s Developer & Platform Evangelism group in Redmond, Washington. He has been working on digital media technologies at Microsoft since 2002. Past Microsoft roles included testing VC-1 codecs and Windows Media Player. In his current job Alex helps customers build and deploy video streaming solutions based on the Microsoft Media Platform. Recent web projects included NBC/CTV Vancouver Olympics, NBC Sunday Night Football and TNT RaceBuddy 3D.